Posted: Sun May 19, 2013 5:42 pm Post subject: Anybody succeeded with this design? No....I don't...sorry, only our the two videos on Youtube, that's all there is to say. I think, like us most others have got them going as soon as the information became available and then had to build and wait for a swarm. So firstly it was the MK1 and now I think people are waiting to stock their MK2s. Our MK1 is doing fine... it is the same volume as the MK2 but a different shape. Some people in the USA tried the MK2 with packages last year but have not reported back, and we would like to hear from anyone giving it a go with either of the hive designs. We still think a swarm is needed but need information from those who have tried other ways. Also we need to see a harvest.... we need this put up on Youtube. I am desperately waiting to populate one i have proudly sitting in the garden. As soon as i do rest assured i will post progress. I forgot to say there are a number of us prepared to see how this works by putting time and effort into reading up and actually building a hive and trying it out in our locations. It may be that for us here in the UK we are too far North and West to get this design up and running but we will not know until it is tried. 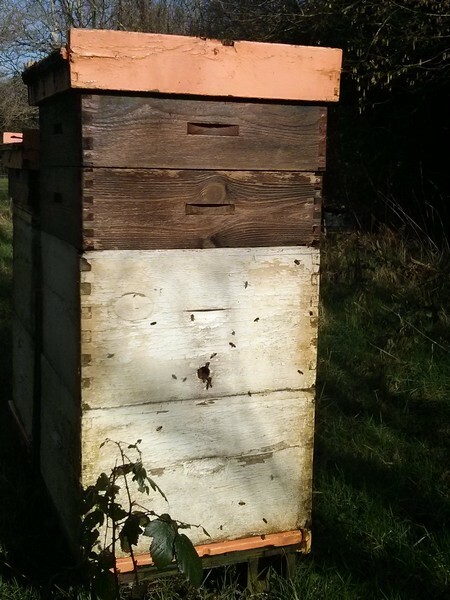 The information we have is that this hive works in temperate zones with European Honey Bees. 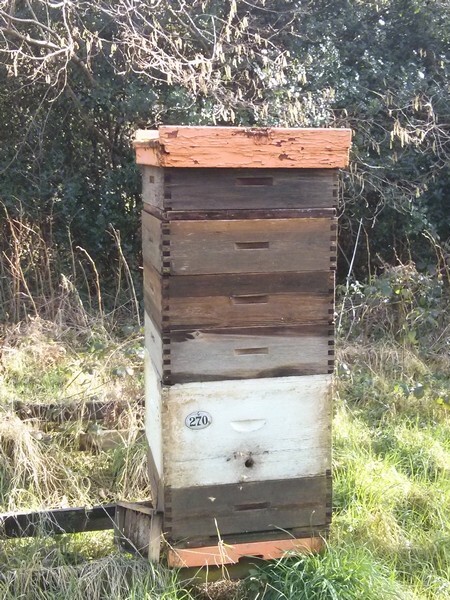 So far our hive is working in a temperate region and with European Honey Bees (Apis mellifera mellifera, black bees native to north-west Europe), working in the sense that after a terrible year they have made it through the winter and are not dead. We have no idea whether we will get honey this year as the spring has been terrible too. Crop or no crop, dead or alive we will make another video in the autumn and post it up so people can see how we are getting on. This is just one hive and is subject to its own stresses which a hive a hundred miles away may not have. This also means trawling the international fora for information and adding it to what is available here, particularly the Spanish speaking fora. In addition we (Hazel and I) and others who contact me/us try to keep up with the Spanish language you tube videos anything with 'colmena Perone' in it, which is very difficult as we are not Spanish speakers so rely on others to help. So far we are still short of empirical evidence about these hives, it is now moving toward winter in the southern hemisphere and honey crops should be in and yet there is a dearth of any kind of data or video of honey harvest. There is no evidence of swarming or much else either. So unless more comes out of Spain and South America we only have what a few of us have done so far and most of those people will update when they have something to say. One issue is that some people may be reluctant to post what could be considered failure of the hive. This is not right as failure is also data, which is what we also need. All this initial research and pilot studies is being done by hobbyists instead of those organisations funded to do so by whatever government you have, so there is only way of finding out and that is by making one and putting a prime swarm in it. As Andy stated - it's a wait and see exercise. My Mk2 is ready in Central Brittany, France (baited and lured) or for a swarm collection exercise. If I have any luck with a swarm, will video and post on youtube. For a person who only recently learned how to take photos, transfer them to the computer, and email them, I'm appreciating what he has done as much as he's appreciating the swarm I gave him. Fantastic, we hope Vernon keeps us posted on progress. 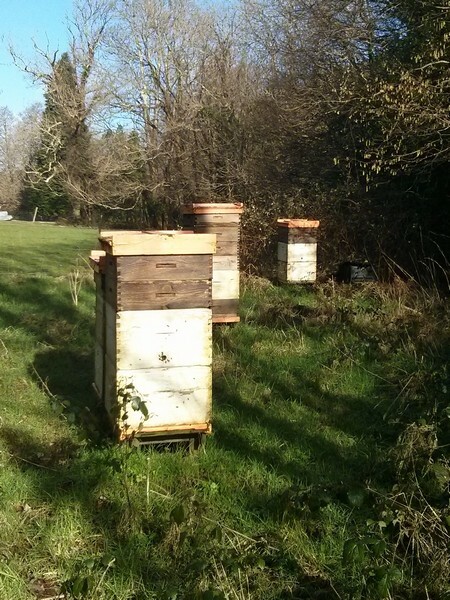 Still no sign of swarming here...getting a bit worried that we will not get ours up and running this year...temperatures have plunged again to under 10C daytime temperatures with only occasional bee flights out of the hives! I just looked at London's 10 day forecast (I couldn't seem to get Shropshire) but the weather looks good for a week or so...fingers crossed you'll get some bee movement. Over the 2012-2013 winter I built 3 Perone hives that I altered slightly to make them legal for use in the USA, gave them a screened bottom board, and a ventilated and insulated inner cover with feeding ports when/if necessary. I also made 2 bait hives, and bought a 3lb package of "All American" bees, which are really an Italian variant. My bees absconded from the Perone-ish hive. I gathered them up from the grass. Put them back in the hive with a much reduced entrance....and they absconded a day or 2 later. I gathered them up from the grass, reduced the hive body by 1/3, kept the reduced entrance....and they absconded a day or 2 later. I gathered them up from the grass and put them in one of the bait hives that I made that uses the same Perone sized top bar. They were content to live in the bait box. After 16 days, I moved them into the Perone-ish hive again, where they remain - now 6 days without absconding. I have kept the hive body reduced by 1/3 since they didn't seem to like all that empty space around them. During the transfer, that I did in the late evening, they were very calm. For the following 2 days there was a lot of orientation flights around the face of the hive. But now, they all seem content and well oriented. The bait box is 8 frames wide and 1 foot deep. It was probably about 1/3 full of comb by volume when I transferred the top bars over. The hive has not been inspected yet by the state. But likely will this year or next. I am interested to see what they will say. BTW, I am no expert...this is my first year, first hive, and first colony for keeping bees. I put a large swarm into a customized Mk1 on the 23rd April. I see through the window that they have filled the top super, there are only two, and presumably are building down. I have a window in the brood box too and will report back when they get down there. As I was checking my hives just now, a swarm flew over my head heading east. I hadn't seen a swarm in transit before, only leaving and arriving. MarkII Perone built, just waiting for swarms now. Could be as early as mid April judging by the weather so far this year! Built Mk11 last year but swarm absconded. Just a theory but suspect northern hemisphere bees don't like large spaces- initially at least! This year propose to place bees in 'upper' chamber where there is a 2nd entrance and place newspaper above 'lower chamber'. Hopefully new swarm will eventually explore lower chamber by eating through the paper by which time they will have become used to the larger volume. Just a thought anyway - any views welcome. Here are my Double Dadant Perone-style hives, as promised. The middle one has only a single brood box, with an extra super. As you can see, I use a single hole entrance. The original, low entrance is left open, but the bees seem to prefer the hole. Successful? Well, the bees have been there for 3 years like this. There have been up to 20 hives on this site since the 1930s, although damp problems seem to have been its biggest drawback. When i was working at the Abbey, there were 50+% losses in this apiary (spring 2005), but I suspect a number of these were caused by the somewhat arbitrary doses of Amitraz used on the bees over winter (not my decision...). By raising the entrance, I'm hoping that damp is less of an issue now. They survived the field being flooded during the exceptionally wet winter. Phil, do you know what is in the boxes? I assume your bees are flying. Did you just use up the Dadant kit, frames and all? Those Dadant brood boxes look big in volume! The brood box is about 20" square and a foot deep. BIG frames. Much better shape for bees than Langs or Nationals, I think, but very heavy when full - two-man lift. The boxes all have original frames. One of them I removed the bottom bars from the frames to see if they would extend their combs into the box below. I haven't dismantled them to see what they have done, though. And yes - they all came through the winter looking strong and healthy. I installed my bees in Spring 2013 with a 3lb package of Italians. Initially I installed the package of bees into the brood box, but with in a few days they absconded. I found the ball of bees in the grass with the queen and put them in the hive again. (So glad the queen had clipped wings!) ...all was well. Until the split, the small hive beetles, and something else arrived. I was trying to be a good Perone hive keeper and stay out the brood box and missed the queen cell development, the growing small hive beetle population and whatever bug ate some holes through the comb. At the height of my 2013 summer development, 1/3 of the Perone brood box was filled with comb and bees, a month later I was down to a ball the size of a grapefruit. Going to be a dead hive for sure I thought.